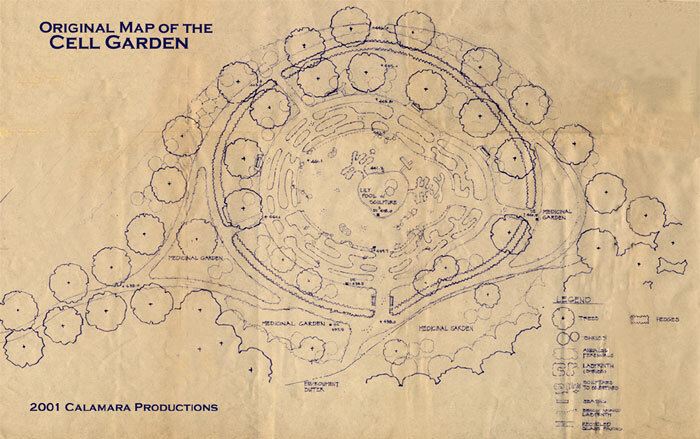 The Cell Garden as an Earth Work (2001), a multidisciplinary project first conceived in 2001, is a fusion of science, art, education, new technologies, and sustainability. The work is figurative in that it combines sculptures and landscape to depict a cross section of a living animal cell or Eukaryotic Cell. The choice to represent a Eukaryotic cell, the same kind of cell that comprises our bodies, was made so that when visitors venture within the membranes of The Cell Garden, they will take an internal journey. The Cell Garden is meant to be experienced on a micro and macro scale – it possesses both an aerial dimension and a terrestrial dimension. As seen from an aerial perspective The Cell Garden stands out from its surrounding landscape, like a verdant crater pulsing with life. At ground level, viewers will have a more intimate experience as they enter the garden and immerse themselves in the living landscape of the cell. The purpose of The Cell Garden is twofold: It is a site for contemplation and experiencing art, much like a Zen garden, as well as an educational experience in which people of all ages and scientific backgrounds will witness firsthand the functioning of a living cell. For the first time in human history, it is possible to examine and analyze the most minute substances we are made of, and to categorize them as three-dimensional data in the fast-growing field of bioinformatics. The Cell Garden will embrace sustainability and will utilize alternative forms of energy, such as solar power and wind power. Many of its components will be composed of recycled materials, and it will also have an agricultural element. The Cell Garden is a gesture toward self-knowledge that celebrates the uniqueness of life and its interconnectedness on our beautiful, breathing planet.